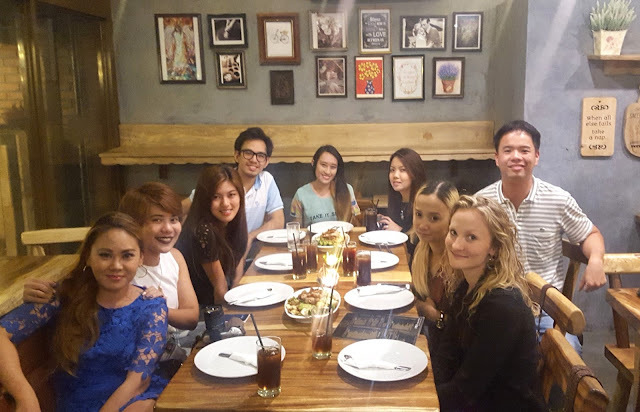 Naimas is an Ilocano word (a Filipino dialect) which means good-tasting or savory or delicious. My heritage is Ilocano and Ilonggo but is highly-influenced by Ilocano through my father's mother side of the family. I grew up with my grandmother's and aunts' Ilocano-influenced cooking. Fact is that northern Filipinos are known to be great cooks and a lot of well-loved and home-cooked Filipino dishes are from the North. 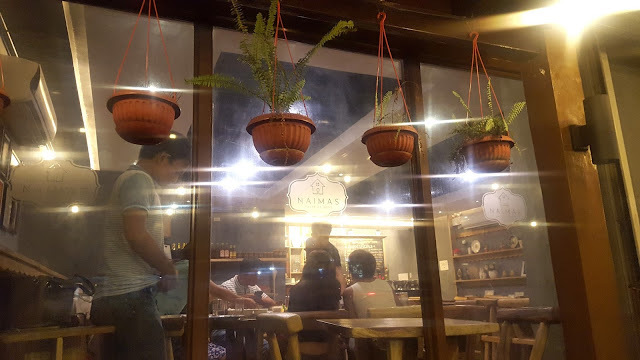 Naimas is a fairly new restaurant in Salcedo Village in Makati; it is just across Mile Long and few steps from Makati Cinema Square. At Naimas they want you to remember what home tastes like. Like what I said earlier, they offer Northern provincial home cooking and have walked the extra mile to stay true to the authenticity of the dishes that they have in their menu. They use the original cooking techniques and put the Naimas stamp on them. They even outsource the ingredients from the Northern provinces to make sure they are organic and the taste would be authentic. Naimas prides itself in using local ingredients such as Native Bawang, Sukang Iloko from La Union & Sukang Paombong from Bulacan, Bagoong Isda, Padas, & Patis from Pangasinan. I am totally digging the ambiance at Naimas. I love how they played well with the combination of rustic, shabby-chic and traditional Filipino for their interiors. It was pleasing and accommodating to the eye. Even the al fresco area had a great vibe making you forget you're in the ever so busy Makati area. So here are the dishes that I got to try at Naimas with my fellow food-lovers. Pancit with Bagnet - Pancit (Chinese noodles) is a regular dish in most Filipino homes especially during parties. It is actually Chinese food but Naimas put an Ilokano stamp on it by topping it with a generous amount of Bagnet. Bagnet by the way is an Ilokano dish of deep fried pork where the pig skin is super crunchy but the meat is super tender. And the fat part, oh no... don't let me even get started on that one! Ok, it was melting in my mouth while I was eating it. I'm not really a pancit fan, but combine it with Bagnet and I will easily change my mind. Well played Naimas on this one! Sinampalukag Kambing - The only soup-based dish that I love is sinigang and sinampalukan is in its alley so I still would try it. Though this sinampalukan uses goat meat, yep goat meat. I have never tasted goat meat, I love lamb chop, have tried horse, croc and monitor lizard meat but never goat. But yeah life is short and one must be adventurous so I tried just a piece of the meat. The soup tasted nice and just enough sourness. The goat meat tasted like lamb but a bit grainy and a little rubbery. It was tender nonetheless. Spicy Fish Tofu - Another Chinese influenced dish but Filipino all too well. It was tasty, the fish was good and yes tofu, no one can go wrong with tofu. Being a little bit biased here because tofu is one of my faves. LOL! Sizzling Litid - Talk about heart attack and strokes! If you want anything but putok-batok this is the dish to order. Surprisingly it wasn't that overwhelming; it more like eating gelatin but a little harder to chew. I like the sauce that went with it which downplayed the fact that you're eating something cartilagenous. Gisaeng Balut - Funny how we would make first time visitors to my country to eat balut (boiled one day old duck egg) but yo be honest I have never eaten balut. I have only sip the juice from it and the yolk but never the bird. What I tried though is the sauce and yeah it was good. This would be a good beer food for the ones who love to eat while they drink booze. Adobong Hipon sa Aligue - One of my favorites from Naimas. I only had to eat a portion of one of the shrimps because I was not able to pop an antihistamine. I love seafood dishes and this one has been added to my fave list. Shrimp and crab fat paste, nothing can beat that combo. Adobong Baboy Ramo - When you hear adobo, nothing can be associated with it but Filipinos or the Philippines. There's no distinct way of cooking it or how it's supposed to taste like. It can be anything it wants to be. Naimas used wild boar/hog for the meat of their adobo. I never in a million years would think would try wild hog meat, but never say never. It was like pork but tougher. How I lived through it was to stop thinking about a wild boar. So yeah I pretty much enjoyed it. Pinatisang Baka - This is beef dish cooked in fish sauce. Another first time for me. I like that it wasn't salty and just enough to give flavor to the beef meat. Gising-gising - I love this dish! This is one of my favorite Ilokano dishes. I even cook this at home. Coconut cream dishes always never fail to put a smile on my face. Love it that the sigarilyas (winged beans) was still crunchy and not overcooked. Turon sa Saba and Halo-Halo - Naimas also offer traditional Filipino snacks and refreshments like this turon and halo-halo. This two did not fail short of what good and well-loved Pinoy meriendas. The turon had jackfruit inside and the halo halo was topped with ube ice cream -both are all time favorites of mine. It really made me nostalgic after dining at Naimas; made me miss my grandma sooo much! She's an Ilocana who cooks oh-so-well. Love it that for a few hours and eating at Naimas made me think and reminisce about her and how she loved cooking for us when I was younger. My only disappointment was that Naimas don't offer "Igado" which is my all-time favorite Ilocano dish. So if you're craving for Ilokano specialties and Northern provincial home cooking (even if you're not a Northerner) Naimas is your go-to resto for Northen Luzon delicious cooking. Theirs are truly comfort food and living up to it. Btw, they also accept functions and events. Favorite ko yang gising gising lalo na kung spicy na gata! Yum! hehehe gata for the win!! !